Using our mxODBC Zope DA™, you can connect your Zope installation to all ODBC compliant databases and data sources - in a hassle-free, robust and scalable way. At EuroPython 2007, we have given a talk about Zope and relational database systems (RDBMS). The talk provides a high-level introduction on how Zope can be used for database web applications and where the mxODBC Zope DA can help. Please see our Presentations & Talks section for details. Robust Mode of Operation: connections which have timed out or go away due to network problems are automatically reconnected. Transaction safe automatic reconnect: when the DA finds that a connection has timed out, it automatically tries a reconnect and replays the transaction on the connection (unlike other DAs which break the transaction scheme by doing a reconnect without replay). Drop-in compatible to the ZODBC DA: the mxODBC Zope DA provides the same interfaces as the old and unmaintained ZODBC DA to allow a smooth upgrade path from this simplistic adapater to the high performance mxODBC Zope DA. On Unix, you will have to install one of the popular ODBC managers iODBC 3.52.x or unixODBC 2.2.x and then register the ODBC drivers for your database with these ODBC managers. The mxODBC Zope DA product is a commercial product and made available under the terms and conditions of the eGenix.com Commercial License Agreement, Version 1.1.0 (PDF file). When purchasing a license for the mxODBC Zope DA product, you will receive a digitally signed Proof of Authorization authorizing you to install the product for use within one Zope Instance, i.e. one Zope installation. These files are made available to you under the terms and conditions of the eGenix.com Commercial License Agreement, Version 1.1.0 (PDF file). This distribution includes the mxODBC Zope DA Zope Product and all necessary eGenix.com mx Products (including mxODBC 2.1) in one binary archive. This distribution includes the mxODBC Zope DA Zope Product and all necessary eGenix.com mx Products (including mxODBC 2.1) prebuilt for Zope installations. You will need to have one of popular ODBC managers for Unix installed on the target system: iODBC 3.52.x or unixODBC 2.2.x. We have successfully tested the Zope DA with iODBC 3.52.6 and unixODBC 2.2.12. This distribution includes the mxODBC Zope DA Zope Product and all necessary eGenix.com mx Products (including mxODBC 2.1) prebuilt for Zope installations. Note that Mac OS X comes with a UCS2 build of Python, so please try the UCS2 product versions first. 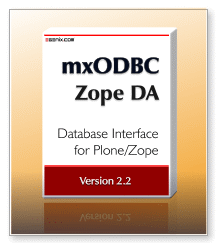 The mxODBC Zope DA Administration and User Manual has the details on how to install and setup the package.